May 2017 - Los Angeles magazine 6AM sit down with BOHN to chat about his I Know EP and work with UNT. Click the image below for the full story. May 2017 - Belgian magazine Tanzgemeinschaft premiere BOHN's I Know EP on UNT Records. Click the photo below for the preview & write-up. 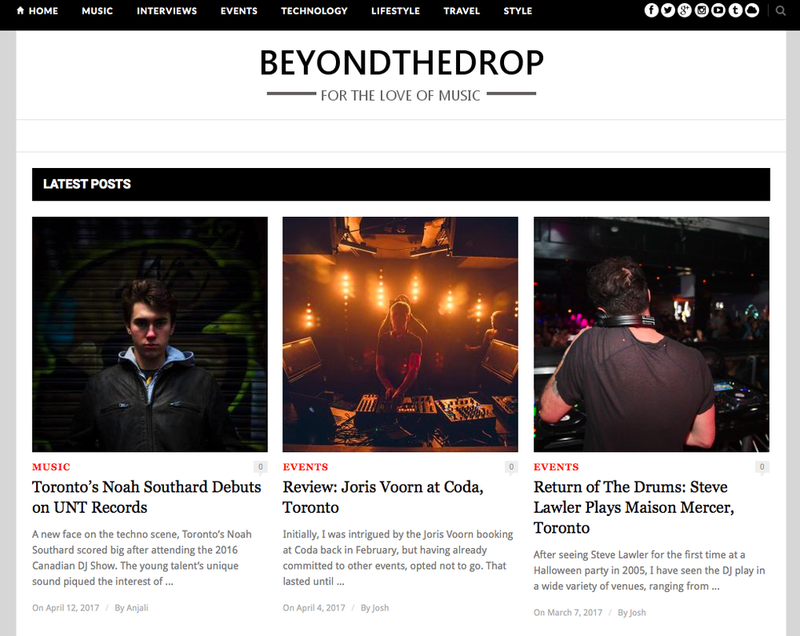 April 2017 - Beyond The Drop review Noah Southard's debut EP: "Unique from the busy and often noisy sounds of today’s techno, Southard’s EP is intelligently stripped back, with minimalist sounds that highlight the producer’s appreciation for the simplicity behind the art of music-making." January 2017 - Tanzgemeinschaft review Monophaze Beyond Home & John Norman Remix - "Warn your neighbours and play it loud! Make sure to drop this one on your memory stick and use it in your set." Read more by clicking the photo below. An Obsession With Sound is now partnering with Chill Lover Radio out of New York City -- the show airs Thursdays at 7pm EST. Streaming via the Chillloverradio.net website, tunein app, SONOS, aha app & more. August 2016 - My Cup of Tech rave about Rafa Ortega's DGT EP - "The perfect midweek pick-me-up." Read more by clicking the image below. July 2016 - John Norman & Exhale sat down with Robotic Peacock during Movement Detroit this year. Read the full interview by clicking the image below. July 2016 - Tanzgemeinschaft on DGT EP by Rafa Ortega - "Simply Brilliant". Read more by clicking the image below. June 2016 - Tanzgemeinschaft review the Republic Remixes EP - "a forthright affair of industrial murkiness and intoxicating techno grooves." June 2016 - John Norman shares his thoughts on the 100th episode of An Obsession With Sound via Manalogue. May 2016 - John Norman's Republic EP got the remix treatment from Antwon Faulkner and Exhale, and got some love from Traxsource as front page featured techno! May 2016 - Antwon Faulkner's remix of John Norman Republic featured on Traxsource's Essential Techno chart for May 23rd. John Norman sits down with Tanzgemeinschaft to talk about music and business. Beyond The Drop reviewed Megan's On Exit EP, and loved it! "the production is definitive of a contemporary techno adventure." Cheers to Barry at Amplified Radio for naming An Obsession With Sound as one of his favourite Canadian dance music podcasts. John Norman will be on hand to review demos during the Get Signed event at the Canadian DJ Show March 11-13. Visit www.cdjshow.com for info and registration.